It’s a holiday story that is so charming, it defies seasonal constraints. In our household, How the Grinch Stole Christmas! by Dr. Seuss lives on the bookshelf, readily available for reading in winter, spring, summer and fall. Like all great tales in America, the Grinch, with his heart two sizes too small, wasn’t allowed to dawdle on the pages of a book. He was quickly brought to the small screen in cartoon, eventually glorified in live action motion picture, and it was only a matter of time until his nearly-heartless ways were to be seen (and heard) on Broadway. 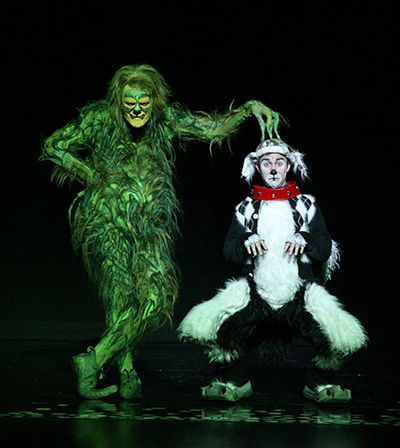 Next month, the Grinch will make his debut in Orange County when Dr. Seuss’ How the Grinch Stole Christmas! The Musical comes to Segerstrom Center for the Arts December 10 – 14. Audiences will find their hearts growing a few sizes along with the Grinch’s when they experience the magic of the beloved tale on stage, which features the hit songs “You’re a Mean One, Mr. Grinch” and “Welcome Christmas” (written by Albert Hague and Dr. Seuss), from the original animated television special. Max the Dog narrates as the mean and scheming Grinch decides to steal Christmas away from the loveable Whos. The Segerstrom production of Dr. Seuss’ How the Grinch Stole Christmas! The Musical is directed by Matt August and choreographed by Bob Richard, based on the original choreography by John DeLuca and originally created by three-time Tony Award®-winning director Jack O’Brien. It features magnificent sets designed by John Lee Beatty and costumes designed by Robert Morgan, inspired by Dr. Seuss’ original book, while the music and book of Mel Marvin and Timothy Mason breathe new life into this story we all know so well. 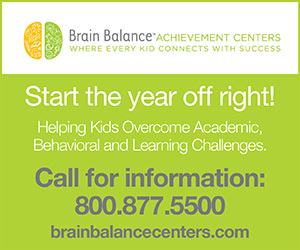 It’s a perfect way for children, parents, holiday-lovers – and especially holiday-loathers – to get into the Christmas spirit. 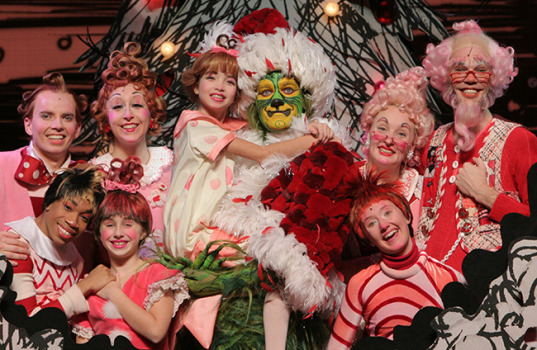 Single tickets to Dr. Seuss’ How the Grinch Stole Christmas! The Musical start at $29 and are now available online at scfta.org, the box office at 600 Town Center Drive in Costa Mesa or by calling (714) 556-2787. For inquiries about group ticket savings for ten or more, call the Group Services office at (714) 755- 0236. The TTY number is (714) 556-2746. The 2pm performance on Saturday, December 13 will include audio description, open captioning and sign-language interpretation. As Orange County’s largest non-profit arts organization, Segerstrom Center for the Arts owns and operates the 3,000-seat Segerstrom Hall and intimate 250-seat Founders Hall and the 2,000-seat Renée and Henry Segerstrom Concert Hall. The Center also houses the 500-seat Samueli Theater, the Lawrence and Kristina Dodge Education Center’s studio performance space and Boeing Education Lab. A spacious arts plaza anchors Segerstrom Center for the Arts and is home to numerous free performances throughout the year as part of Segerstrom Center for the Arts’ ongoing Free for All series. The Center presents a broad range of programming each season for audiences of all ages, including international ballet and dance, national tours of top Broadway shows, intimate performances of jazz and cabaret, contemporary artists, classical music performed by renowned chamber orchestras and ensembles, family-friendly programming, free performances open to the public from outdoor movie screenings to dancing on the plaza and many other special events. In addition to the presenting and producing institution Segerstrom Center for the Arts, the 14-acre campus also embraces the facilities of two independent acclaimed organizations: Tony Award®-winning South Coast Repertory and a site designated as the future home of the Orange County Museum of Art.